Godzilla Tours Tokyo in 2014! Godzilla’s official teaser website has been released, celebrating his 60th anniversary coming up in 2014. The website is interactive and has several secret surprises that can be activated with your keyboard. 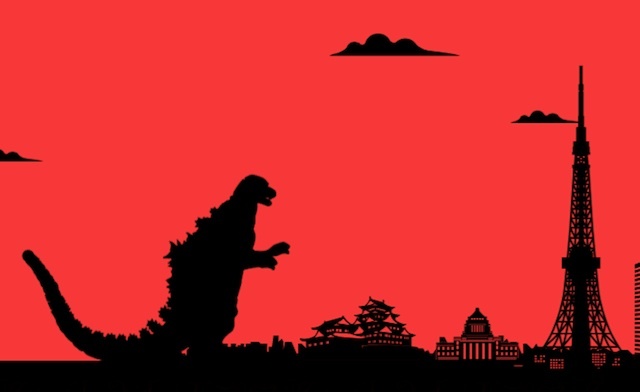 Godzilla appears in silhouette amidst landmarks such as Tokyo Tower, Tokyo Sky Tree and Mount Fuji. As the website instructions say, when the right arrow key is pressed, Godzilla walks! Other secret tricks are shared below. There might be more, so let us know if you find any! – Press “G” key >> Godzilla blows fire! In Japan, the digitally remastered version of the first Godzilla movie (1954) will be screened in eighty theaters, beginning in June 2014. And even today the famous monster is set to draw crowds; the most recent Hollywood “Godzilla” movie will open on July 25.